This project is supported by the GoggleWorks Center for the Arts 2018 Summer Artist-in-Residency program. Thank you for helping make my art proposal become a reality. I very highly suggest other artists apply for future residencies at GoggleWorks, perfect for artists working in glass, ceramics woodworking and painting. This is my 15th art residency. It is situated at a factory turned art center named GoggleWorks, in Reading, Pennsylvania. Most people are so used to seeing the word Google, that they don't notice the double g's. This was an old goggle factory, yes goggles used to protect your eyes (below, right). I find some people also pronounce Reading like reading a book... but no, people here say RED- (like the color) -ing. Now that this is cleared up lets go onto the exciting part. For this 2018 residency, three juried artists are given a work space, apartment to share (top left, the home with the green door), and a generous stipend for materials and supplies. My work space has large tables and full access to kilns and the sandblaster. The staff is amazingly helpful and energetic. Below are photos and more information on my proposed project named "Disenchanted Alice". This series of stained glass works illustrates everyday activities of a modem day Alice in Wonderland. It is 2018, and this classic beauty is living a mediocre life in New York City, with blue hair and everyday events showing Alice with her head in the clouds drinking a coke-a-cola, Alice stoned with her body unraveling while she is waiting for the subway, Alice in bed with a can of mushrooms, in the form of mushroom soup, among other designs. The underwhelming subject of this work is done on purpose. The themes aim to bore the viewer, while the composition, technique and colors will hopefully wow them. I ask: Medieval stained glass windows taught the story of the Bible, but does the public still learn these stories when viewing windows in churches, or are we overly exposed to too much competing imagery and don't notice historic windows? My challenge is to update contemporary storytelling while using traditional stained glass techniques. Every part of these panels are hand painted, then kiln fired. No silk-screening or decals are used. My challenge for this project was to paint very detailed imagery. 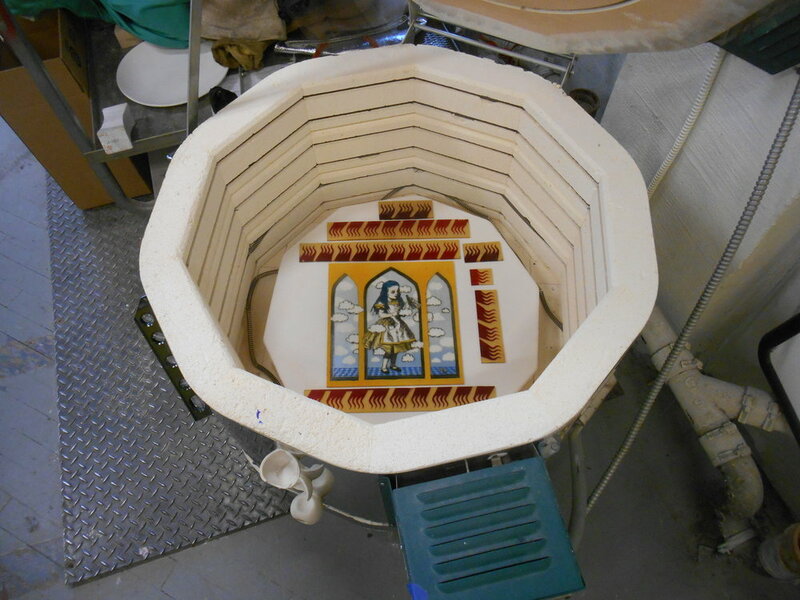 Enamel paints are kiln fired onto the glass then soldered, and set into a light box with LED lights. I will be continually updating this blog with more work like my second work below. Titles still to come. Enjoy!